Shatili is part of the Tentative list of Georgia in order to qualify for inclusion in the World Heritage List. Shatili is a historic highland village located in the isolated Arguni valley on the northern slope of the Greater Caucasus mountains. The village is described as « a unique complex of medieval-to-early modern fortresses and fortified dwellings of stone and mortar, which functioned both as a residential area and as a fortress ». It consists of the terraced structures dominated by flat-roofed dwellings and some 60 towers which cluster together to create a single chain of fortifications. It is on the TL since 2007, based on criteria (v) of cultural landscape. The extend of the project are not clerly stated, but looking at WHS in Georgia, it probably only includes Shatili village. It woudl be a pity, as in my opinion, the entire valley is worth of OUV, including some other defensive towers or village-fortress like Mutso, about 10 km further dwon the road. Shatlili is very well preserved, as most inhabitants were focibelay relocated in Gerogian lowlands in the 50’s. The empty village was used as a set for Georgian movies in the 60’s, and inhabitants came back in the 70’s. 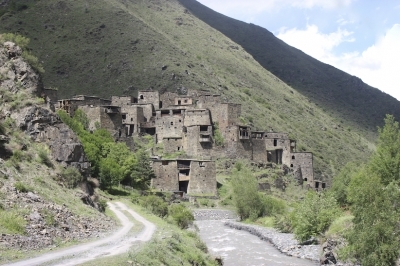 They came back in newly built houses at the bottom of the village, leaving the old village-fortress untouched. As for Mutso, inhabitants did not came back, leaving the area unspoilt. Most village have now been sensitively restored. Shaltili can only be reached during summer. It is a 150 km from Tbilissi, of which 100 km are on dirt roads. It takes about 4 hours, climbing to the 2676 meters high Datvisjvari pass on the way. Views from that roas ard spectacular. A 4x4 car is recommended as the road is a bit rough at places, but is altogether safe, and a private driver is not necessary. Being isolated and far from main town, few tourists visit this valley, and I had the village almost for myself. I stayed the night is a basic guesthouse, which was luckily located in a well-restaured old house within the village. A basic but delicious meal is included in the price, as no restaurants are available in this valley. I my opinions, Shatili is very worth the long trip, and is probably worth a WHS status.